Beer #113 Del Ducato A.F.O. How served: 750ml wide bottom capped bottle poured into a Boulevard Smokestack glass. I paired this beer with: Zuppa di Tomate e pesce. This pairing went well. Tasted on: Tuesday May 25th, 2010. Note: This beer had a nice piney and citrusy nose. The taste was like the nose, you get a mild piney and a sweet citrus taste up front, which then lead to a refreshing and yet mild grapefruit rind taste. At 5.2% abv this would make a great session beer as it is extremely drinkable. I picked this beer up in Italy a few weeks ago while I was in Greve in Chianti, Tuscany Italy. 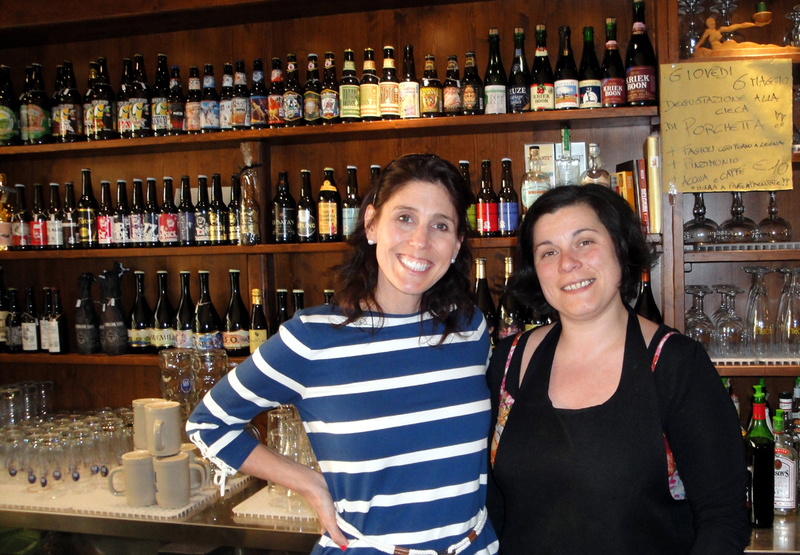 I happened to run into a great craft beer bar, La Birrateca di Greve. This place has an awesome beer list, they had at least 65 different high end Belgian’s (sitting in a cooler near the entrance), 35 American’s including Port Brewing, Great Divide, Hoppin’ Frog, Founders, yes even Breakfast Stout and about 65 others including the BrewDog and Mikkeller line-up. Mikela, the barmaid and part owner of this establishment was very knowledgeable about her beers and craft beers in general. She did a great job of describing the 2 dozen or so local Italian made brews to me. When I asked her what her favorite beer was, she picked this beer, A.F.O. She said she was a hophead and this was one of the hoppiest Italian made beers she’s had. I then asked her if it was as hoppy as some of the Californian beers she’s had. She said “no no, not that hoppy, but for Italy, it is very hoppy”. Since I trusted her judgment, I’m glad I did, I picked up this beers and a few other, which I will get to in a future post. From their website: Birra di alta fermentazione una libera interpretazione del concetto di Pale Ale. Di color ramato intenso, è caratterizzata dalla generosa luppolatura che prevede l’utilizzo di oltre dieci luppoli di diversa provenienza (tra cui gli americani Chinook, Cascade e Simcoe che le conferiscono profumi agrumati e di frutta esotica) e da un carattere caramellato con delicate tostature che equilibra egregiamente l’amaro. La A.F.O. è stata la seconda birra che abbiamo prodotto, uscita contemporaneamente alla VIÆMILIA, quando ottenemmo la licenza alla vendita, a fine marzo 2007. Ricordo che in quel periodo facemmo una festa nel centro di Parma nel piccolo grande bar del nostro amico Flavio, servimmo la A.F.O. a pompa ed ebbe un successo straordinario: ci fu persino un gallese che mi disse orgoglioso di averne bevute ben 14 pinte! 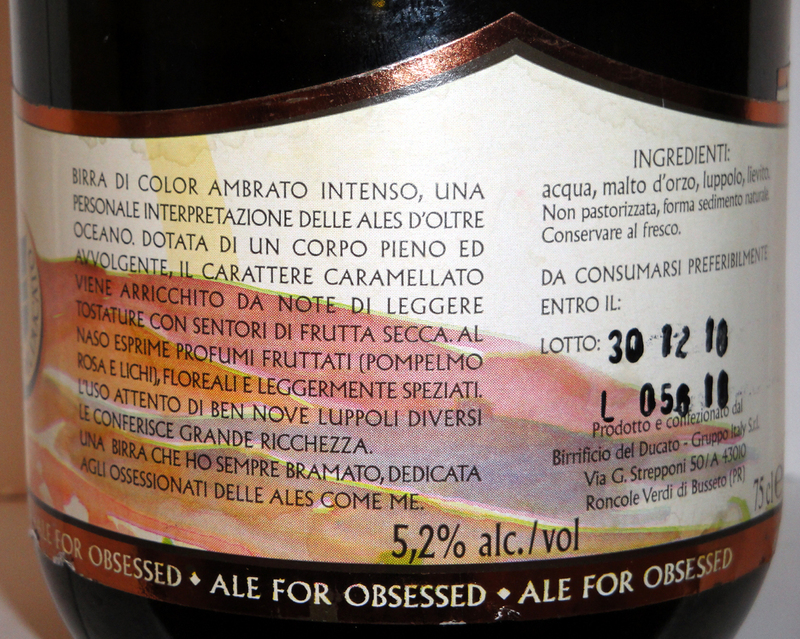 La storia di questa birra risale al gennaio 2006 quando per la prima volta venni a contatto con il carattere così nuovo (per me) e irresistibile dei luppoli americani, tuttavia mi resi conto fin da subito che nella Pale Ale dei miei sogni volevo esprimere qualcosa che andasse ben al di là di questo, da allora la realizzazione di un bouquet complesso, affascinante e mai consueto è stata la mia sfida. Per questo viaggiando tra Inghilterra e Germania, visitando i coltivatori di luppolo e sperimentando varietà anche molto lontane (Nuova Zelanda) ho portato avanti una ricerca nel territorio olfattivo dei luppoli che, forse, non è del tutto terminata (fermo restando il carattere inconfondibile della A.F.O. che rimarrà sempre tale). With the help of Goggle Translator : High fermentation beer a free interpretation of Pale Ale. Intense color of copper, is characterized by generous hopping that involves the use of more than ten hops from different backgrounds (including American Chinook, Cascade and Simcoe giving it smells of citrus and tropical fruit) and a caramel character with delicate toasting that admirably balances the bitterness. A beer that I have always longed for: dedicated to the Ales obsessed like me. 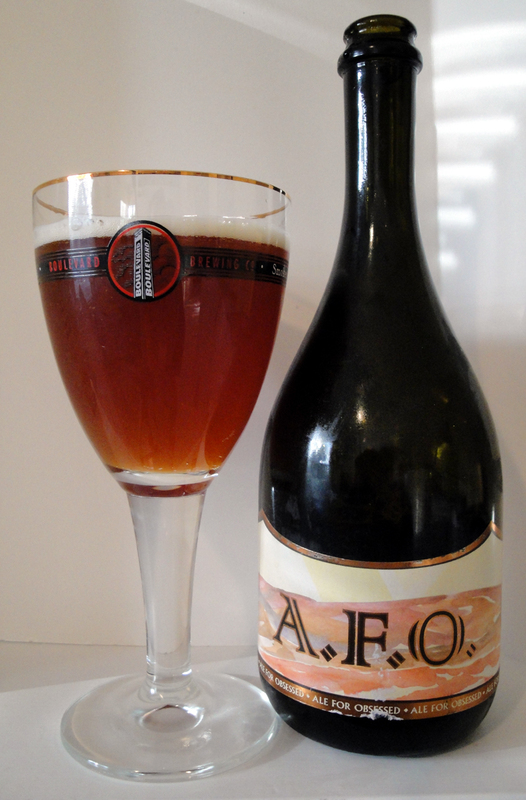 The AFO was the second beer that we produced, VIÆMILIA output at the same time, when we got the license for the sale in late March 2007. I remember that time we had a party in the center of Parma in the small bar of our great friend Flavio, we serve the AFO pump and had an extraordinary success: there was even a Welsh told me very proud to have drunk 14 pints! The history of beer dates back to January 2006 when for the first time I came in contact with the character so new (to me) irresistible and American hops, but I realized early on that Pale Ale in my dreams I wanted to express something that went well beyond this, since the creation of a bouquet, complex, fascinating and never has been my usual challenge. Therefore traveling between England and Germany, visiting growers and hop varieties also experiencing very far (New Zealand) have carried out a search in the olfactory area of hops that perhaps is not quite finished (without prejudice to the unique character of the AFO that will always remain so).